The Janesville area has been assigned a high-risk zone rating by the EPA. Radon is a highly radioactive gas, a byproduct of uranium ore, which is found everywhere around the world. No one really knows the reason behind the high level of the gas in Janesville, but there are ways to mitigate it to a safe level. Any household or business should be tested for unsafe levels of radon gas. Radon mitigation systems are designed to not only mitigate the existing radon in the home but also keep radon out in the future. Our company has been in business for over 20 years and we are more than willing to help you understand the radon mitigation process and install a system custom fitted to your home. Give us a call for a free estimate. Radon is a sizable concern for both residential and commercial properties and is responsible for many cases of lung cancer. Radon in Janesville is a natural airborne compound found in the ledge rock, existing in the earth for millions of years. The understanding of how it impacts the human body is fairly new. Fortunately, property owners are beginning to acknowledge that radon is a local health concern and it must be cured at the source. There are radon mitigation strategies to achieve a long-term radon reduction in homes and other types of dwelling structures. The first step to determining if you home in Janesville is in need of radon mitigation is to properly test the level of radon in the home. This can be done with a DIY charcoal testing kit which we offer, or you can have us do a digital test to get fast and ultra accurate results. Both methods are effective, and once you get the results back, we can set up a plan for you to get that radon gas mitigated from your home if it comes back elevated. For testing options and scheduling, click the link below and we can help! An elevated level of radon in Janesville homes poses a greater risk of becoming a victim to lung cancer. 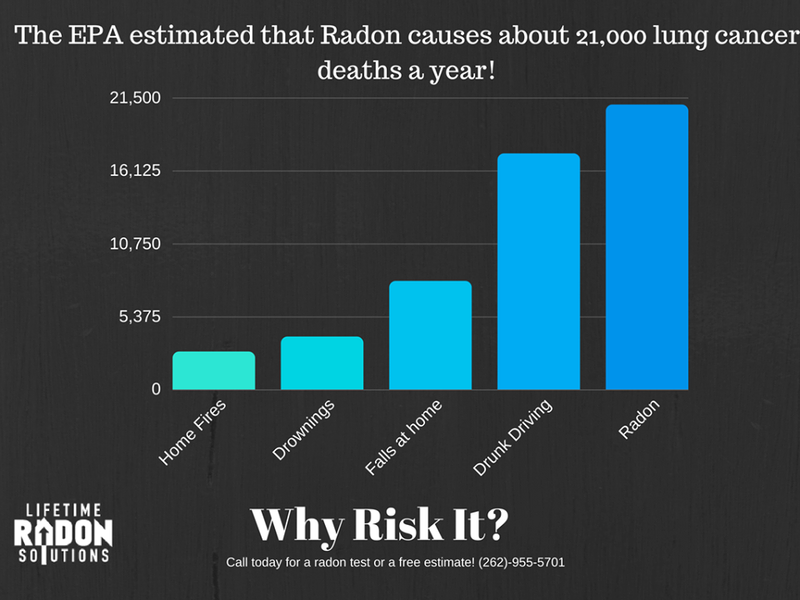 In fact, the EPA estimated that around 20,000 people a year die from radon caused lung cancer, making it the second leading cause only to smoking. Our certified radon techs can custom fit a radon abatement system to your home in Janesville to get those high radon levels reduced to keep you and your family safe. Remediating radon from homes is easily the most common procedure that we do, so you can be sure that it will be done right and in a timely matter. Our company provides the services to mitigate radon in homes, schools, and businesses. If you are in the process of searching for the right company to install a radon mitigation system for your home, there are a few things you should consider. First you should check if the company is certified by AARST (American Association of Radon Science Technologists) and the NRPP (National Radon Proficiency Program). You can rest assured that when you choose a company certified by those organizations that you will be receiving a system that complies with EPA standards, and the workmanship will be impeccable. Companies not certified by those organizations can have unpredictable workmanship leading to many issues that can cost you later. Don’t trust the safety of you and your family as well as the beauty of your home to just anyone. Another factor to consider is how long the company has been in business. Our company has been in the radon mitigation business for over 20 years. There are a lot of other companies out there that are attempting to get into the radon mitigation business with no experience other than basic construction skills. Don’t trust those other companies to stay in business long enough to be able to service your system if anything goes awry. We have a lifetime warranty on our workmanship and the longest fan warranty in the state, and you can be sure that we will be in business for the life of that warranty. We aren’t saying that you must use our company to install a radon mitigation system for your home, but we strongly recommend considering these factors when choosing the right company for you. If you are interested in getting a free quote, give us a call or click the link below and we will be happy to help you out!